This Midtown liquor store sells high-octane alcohol in small amounts. Some neighbors want it to stop. In a part of Midtown Anchorage where homes and condos border busy strip malls, neighbors and businesses are fed up with a certain kind of garbage: miniature liquor bottles and crushed Steel Reserve beer cans. They say these drinks are favored by chronic alcoholics, many of whom live on the street, fueling blight. 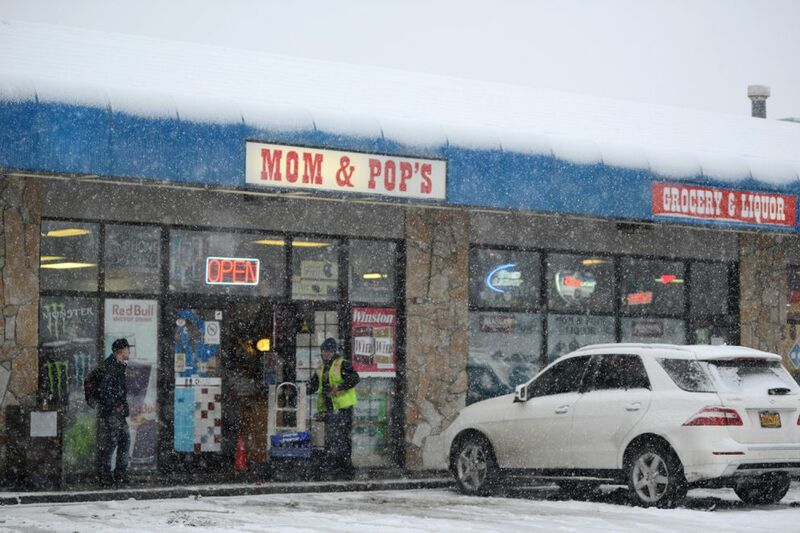 And some blame, in part, one family-owned store near 36th Avenue and Arctic Boulevard called Mom & Pop's Liquor and Grocery. The fight isn’t a new one. A number of liquor stores in the city have found themselves at the center of a neighborhood’s frustration over street alcoholics and trash. Each time, the discussion raises questions about how much of the problem is about alcoholics and how much is about the availability of certain kinds of low-cost, high-octane alcohol. Mom & Pop's owners question how fair it is to blame them for complex community problems. Mom & Pop's is a small place wedged between a Domino's Pizza and a deli. Inside the liquor area, bottles of Steel Reserve beer sit in tubs, $1.25 each. 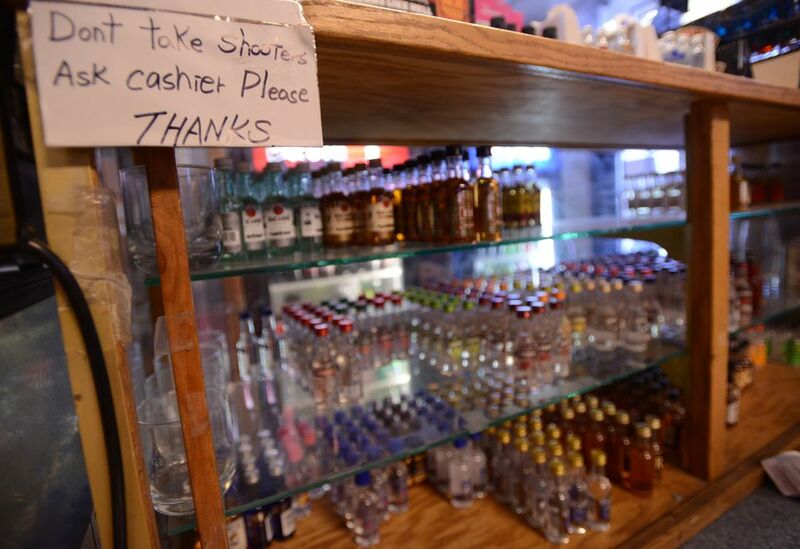 The tiny bottles of hard liquor, known as "shooters," are in the case by a register — a customer has to ask the cashier to buy one. On Wednesday, Eddy Lee, 25, was working the counter with a chocolate-brown Shar-Pei named Bamboo. He runs the store with his parents, who are from South Korea. He grew up in Anchorage and studied international business at a college in Washington. About two years ago, Lee's parents bought Mom & Pop's from another Korean family that was having trouble running it. They've tried to be good neighbors, Lee said. The store is one of several in the area, including one right across the street. He said some of the neighbors' complaints are built on assumptions. He doesn't sell to chronic inebriates, he said, but he knows the market in the neighborhood and does try to sell what locals want to buy. "People work hard, and when they come and want to get a couple of drinks," Lee said. "They're definitely spending less money — on shooter stuff (instead of) expensive stuff." The neighbors, however, are convinced the shop is a problem. In October, the Midtown Community Council filed a formal petition with the Anchorage Assembly. The council wants to bar Mom & Pop's from selling the miniature liquor bottles and single cans of beer when the store's license is up for renewal. The petition cites "surging levels of public drunkenness, with inebriates in and around our residences, businesses and parks." Peggy Robinson, a former council president who lives in the neighborhood, said she picked up more than 40 cans and bottles on a single day in September. The brands of the containers were almost all available at Mom & Pop's, she said. One particular brand, Steel Reserve, was not sold at the other nearby liquor store, Robinson said. Robinson also said Lee was invited to community council meetings and didn't show up. She said that was a factor in the council's decision. "I'm not trying to shut them down," said Robinson, a former council president who lives in a condo behind Mom & Pop's and has shopped there herself. "I'm trying to get their attention." Similar fights have played out across Anchorage. 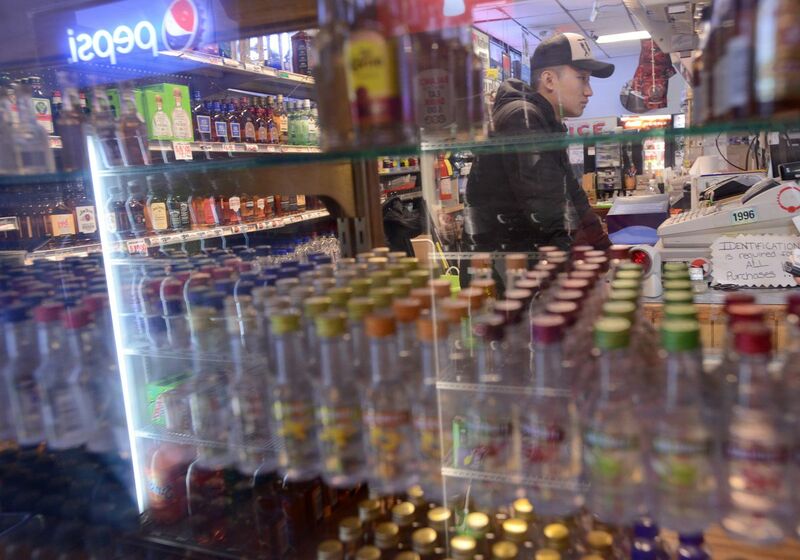 In 2014 in Fairview, neighbors pressured two liquor stores — the Oaken Keg at Carrs/Safeway and Spirits of Alaska — to agree to more tightly regulate alcohol sales after nearby business owners complained about public drunkenness and a high volume of police calls. Spirits of Alaska closed the following year. Neighbors and the city Assembly decided the store hadn't held up its end of the bargain, and state regulators yanked its liquor license. The owner's husband said at the time that it was unfair to "attribute the sins of the city to this particular license." But Fairview property owners saw it as a chance to take back the neighborhood. Sharon Chamard, a criminal justice professor at the University of Alaska Anchorage, helped spearhead the Fairview council's efforts. Since Spirits of Alaska closed, Chamard said she felt she'd seen a difference in the number of people hanging out in the area. But Chamard said she hoped to run a scientific study in the future, noting that there were still problems in surrounding blocks. In Government Hill, one store is supposed to place a sticker on all products sold as individual containers so empty bottles discarded on the street could be traced back. Downtown stores carry restrictions on the minimum price of six packs and high-alcohol wine. Tim Potter, who works in Midtown as a senior planner with DOWL-HKM and has long been involved in community issues, said he expected the Midtown Community Council to push for similar restrictions on other stores. He said that while alcohol and its effects are complex, stores have some responsibility. "While it may not be their job to walk behind these folks and pick up empty bottles and trash, they do need to be responsible enough to recognize that what they're selling and who they're selling it to is having an impact on the neighborhood," Potter said. Lee said he wasn't aware of the community council's formal actions until a reporter asked him about it. He said he didn't feel he'd had enough communication from Robinson and other council members. He said he was open to making changes, but he suggested the restrictions would have a bigger effect on responsible drinkers who live in homes and apartments nearby. Sherman Ernouf, a partner in the Anchorage law firm Ernouf and Coffey, which has represented numerous alcohol establishments on liquor license issues, said he's seen the Anchorage Assembly increasingly use its power to impose restrictions on alcohol licenses in response to community complaints, even if there isn't scientific data to show that it works. "It's becoming much more topical, with crime being up," Ernouf said. "These community councils are doing what they can, and this is one thing they can do." Even if a liquor store changes its inventory or prices, chronic alcoholics have alternatives, like mouthwash or other products that contain alcohol, Ernouf said. But Ernouf said he also advises his clients to be proactive in communicating with neighbors and community councils. That can often straighten out concerns before the Assembly gets involved, Ernouf said.